This Hook-and-Loop conversion disc has pressure sensitive adhesive (PSA) on one side and Hook-and-Loop "hooks" on the other. Just attach the PSA side of the conversion disc to a Shopsmith steel sanding disc and you'll be ready for some quick sandpaper changes and cooler, cushioned sanding with less heat build-up and smoother surfaces. 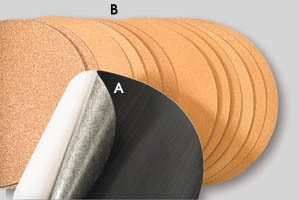 Note: Conversion disc only, order 556120 Hook-and-Loop AO disc sanding package for a package with conversion disc and hook-and-loop sandpaper discs.